There’s been just enough rain to make a fertile fungal home on much of our downed timber. We welcomed 2018 with a healthy dose of karma yoga practice this month. Between the 7.25″ of rain that have fallen so far, thirteen yogis and yoginis made the pilgrimage to the land (Gretchen, Della, Michael, and Tam for the first time). Our celebratory noisemakers are a chorus of chainsaws as we continue to cut and clear trees that fell in the fire and subsequent landslides last winter. Cory, Jon, Michael, and Tim strategizing tree removal. Photo by Gretchen LeMaistre. We’ve so far been blessed with rain that has comes in short bursts with just enough space between to give us time to divert water away from our structures and into our drains. Meanwhile, the land erupts in infinite shades of green as new life announces it’s presence in this bountiful ecosystem. A blanket of moss weaves a tapestry across the uphill slope along our path. Michael and Kay build a berm to divert rainwater. As we continue the process of exploring permitting parameters and designing our new hermitage this winter, we delight in slowing down, tuning into nature’s powerful lessons, and exploring our path forward together. Eliot contemplates the work of the Esalen Indians who came before us at one of three grinding stones on the land. Photo by Lacey Segal. 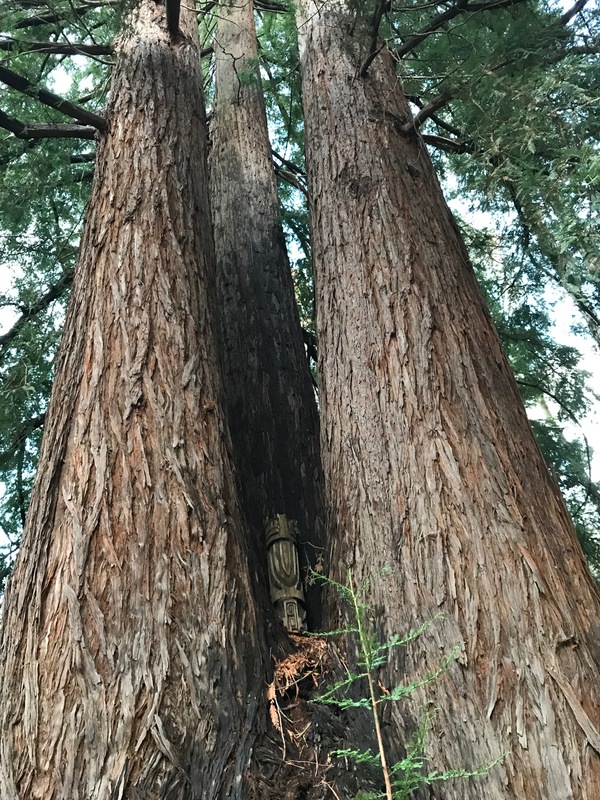 Our trio of gatekeepers welcome visitors at the entrance to Sweetwater Sanctuary – a several hundred year old stand of redwoods that is among the last you encounter as you climb Palo Colorado (Spanish for “redwood”) Canyon. If you’d like to offer ideas or volunteer to support the hermitage, email us at info.sweetwater@dharmata.org. If you feel inspired to contribute financially, you’ll find current items of need on our wishlist or become a Friend and donate to the ongoing maintenance of the land here. Eliot, Tim, Lacey, Bodhi, Kay and Cory (taking pic) headed up to meditate together at Vulture Peak.